Biscayne Bay is the largest estuary on the coast of Florida and offers great sailing, snorkelling, swimming, and sunbathing opportunities. For nature lovers, it is a great destination as it nurtures a large variety of wildlife. If you have a long weekend in hand, then plan for a Biscayne Bay Yacht charters vacation! Before you set to start, here are few things that you must know to make a proper vacation plan. What is the ideal route for Biscayne Bay Yacht charters? Plan your Yacht sail from Miami and visit the beautiful Biscayne Bay. As this is a lagoon, you might find it difficult to sail in your Yacht. Instead, you can simply take a boat from the Yacht and explore the beautiful interiors of this Bay! The places to visit two places are Elliot Key and Boca Chita. Elliot Key: Located in the National Park, this place holds its pride in its glassy water and beautiful sandy beach. You will love to see the pineapple farming there. As there is no shack of restaurant in the beach, the smart choice is to have food in your yacht first or at least carry them in your Biscayne Bay charter sailboats. This place is also good for swimming and hiking. Boca Chita: on the other hand, offers great snorkeling options. There’s a shipwreck in the waters, and corals have formed all over it. Eels, Lobsters, and other tropical fish love to swim through it. Biscayne itself is a National Park and it is 95% underwater! Sea turtles, American crocodiles, and alligators, many endangered species, soft corals, sponges, whales, dolphins, are just a few examples of the extensive wildlife you expect to see. Also, there’s an extensive mangrove forest for you to explore. Take your boat and sail off to see coconut grove, the greenest part of Miami. The verdant colours of vegetation, along with swaying of the palm trees with the wind, make Coconut Grove a site that must be visited. You can shop, just stroll and explore the area. If you’re a history buff, check out the Peacock Inn and the Barnacle Historic State Park. The former is the first hotel here, established in 1882 and the latter, the first house in the area built in 1891. If this is tempting you to set sail immediately! If you prefer motor yachts over regular sailing, there are great luxurious options for you. A luxury motor yacht will typically offer great outdoor space, sun pads, spacious cabins and even a Jacuzzi if you want one! Some offer other amenities as well like jet skis or wave runners. A crewed motor yacht charter Biscayne Bay could fit from 8-12 passengers and could cost $8000 and up per day. Select the bareboat options if you want to try your hand at sailing and if you prefer to be pampered, choose the crewed option. The price obviously differs between the two. A crewed boat, accommodating 6 guests would cost anything between $7900 and $10000 (approximately), whereas a bareboat would have a range of $4500- $6200 (approximately) for the same number of guests. Many have BBQ, autopilot options, fishing gear, etc. The crewed ones even offer kayaks and snorkeling equipment so choose your Biscayne Bay charter sailboats accordingly. You can opt for Bareboat Catamarans with autopilot, GPS, and air conditioning facilities; this is a great option if you are a group of 8. They can cost between $5600 and $6700 (approximately). When you are traveling in Yacht; there are certain things that you must carry. Read on to know what they are. Sunscreen (the sun can be strong, and you want the tan, not a burn!) sunglasses, etc. Most importantly camera for the gorgeous sites you would be exploring on Biscayne Bay. Mid-December to mid-April is the best time to visit as the temperature remains pleasant, the water remains crystal clear for snorkelling, and there’s a lovely wind for sailing. The crowd is less in January and February, so take advantage of it. 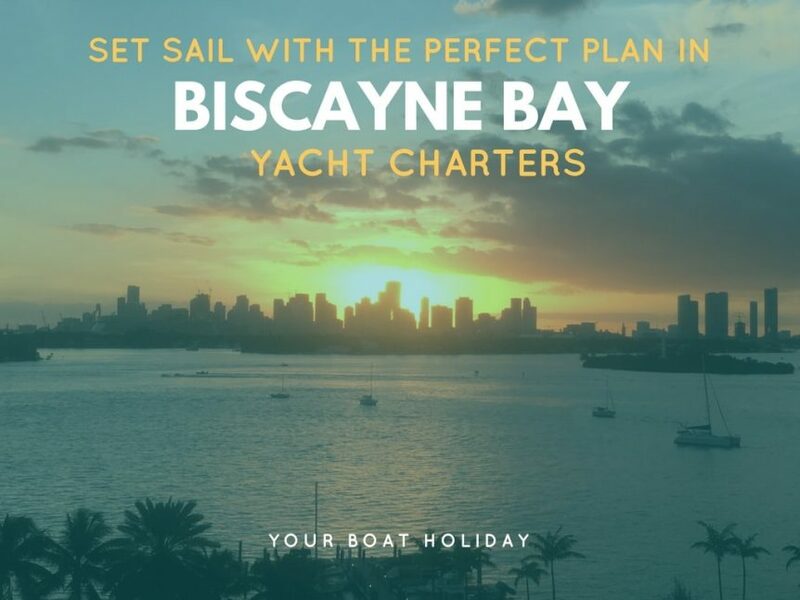 Pack your bags, plan your vacation and go sailing Miami: Biscayne Bay Yacht Charters! SEND NOW YOUR ENQUIRY FOR YOUR NEXT SAIL AND MOTOR YACHT CHARTER BISCAYNE BAY!